A short anecdote: When I was about 5 years old, I remember being overjoyed and jumpy hearing the song "Puff, the Magic Dragon" over the radio. It wasn't until many years later, in highschool, that my memory of this song was challenged with the controversial interpretation when a fellow student asked me, "You know what 'Puff the Magic Dragon' really means, right?". It only took me a couple seconds to connect the dots; I was shocked and in disbelief when I heard this. 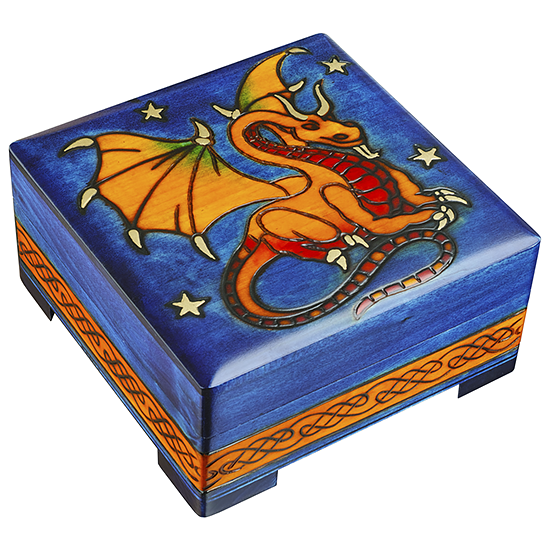 | This cute magical dragon comes on a square box with triangular shaped feet, on a rich deep blue background. The dragon has a base color of yellow, with green and red gradients; gold metallic paint accents on the stars, horns, and talons. The sides are dressed with a loop of celtic knots.